Several months ago (June of 2006, in fact) the light outside was perfect for macro work, but there was a problem: it was pouring rain! My camera is not even weatherproof, let alone waterproof, so I did not want to risk damaging it even for a couple of shots. I was determined to get pictures, and was excited about the possibility of getting shots with waterdrops in them. The Weather Network for Halifax told me it would be raining for days, so I could think of only one solution - waterproof my camera! I equipped my Nikon D70s with a Nikkor 60mm Micro (with lens hood attached) and an SB-600 flash (for fill-light, if needed), then covered the entire camera in a large, clear, plastic bag. The opening of the bag was at the bottom of the camera and I tied a knot in it there (right next to the tripod mount). I used blue mail elastics around the front of the lens hood, the front of the flash, the base of the flash, and around the viewfinder (with the eyepiece removed, there is enough of a lip there for the elastic to grab onto). I then cut one hole for the front of the lens (I would keep the camera pointed down to keep the front lens element dry - the lens hood aided in this) and for the viewfinder. Elastics at both of these points are crucial to keep the rain out. I did not cut a hole for the flash, as the plastic would make little or no difference to the flash output or white balance. Now, for camera settings. I was able to change camera settings though the plastic bag, but it was slow and tedious, so I tried to set what I could while both the camera and I were dry. First, I shoot in Aperture Priority - this way I can control the depth of field. Next (and this was the first time I'd done this), I shot in Auto ISO, telling the camera not to go below 1/125s. This would ensure I had enough (though sometimes just barely) shutter speed to eliminate handshake from the images. I had the SB-600 for fill flash, and it worked excellently. I rarely used it, but it did save a number of shots that could have been ruined by high-ISO noise or slow shutter speed that ISO would not be able to compensate for. There was a lot of light, despite the heavy clouds and rain, so the odd time I used the flash, it was not the primary light source. It just bumped up the light enough to allow the shot to happen. Here's an image from that day - shot with the setup described above, and no flash. So, why was the light perfect for macro work? I find dark, heavy clouds diffuse sunlight very well, so that overly bright highlights and very dark shadows are eliminated. It is not so much so (as you can see in the image above) that texture and depth are sacrificed, however; on the contrary, more detail is able to be captured, light balance and colour balance are easier to control because they don't change as frequently as they do in sunlight (because of shadows, clouds, and reflections from other objects). How did I keep myself dry? Well, good ole' Gore Tex. Three-ply XCR jacket and pants combo from Mountain Equipment Co-op did the job, and sandals on my feet. So not only did I get the light I wanted, and the water drops I craved, but I had the park (Halifax Public Gardens) to myself. Everyone else stayed home that day because of the pouring rain. What more can a photographer ask for!? Thanks for taking the time to read this. My main goal lately has been catching up on photo editing. I'm two months behind and quickly closing the gap. I hope to post more on here in the next couple of days. Posted by Matt Greer at 12:59 p.m. Fantastic photo! 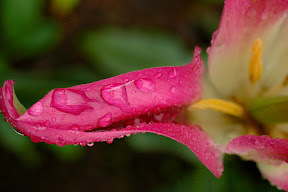 I am just learning to use my camera and always wanted to get shots in the rain but was not sure how to do it. thanks for the information. Some very nice photos in your albums, by the way. And your tutorials are great to fill in the gaps my 5 days course of Photoshop left me with..
Hi Matt, thank you for some great advice! I am from Ireland, where it has been raining all summer. I am sick of waiting for the sun to come out so I was looking for some inspiration for shooting in the rain. That beautiful shot is just what I needed, Thanks!